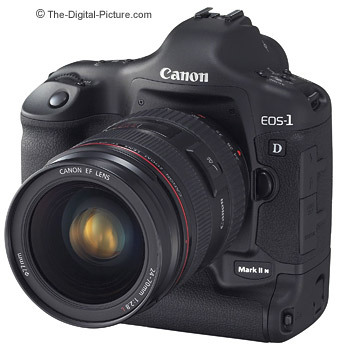 Note: The Canon EOS-1D Mark II N has been replaced by the Canon EOS-1D Mark III. After great debate, I have decided to not write a hands-on 1D IIN review. It is just me here and I have to prioritize what I am working on. Apparently some of the other camera review sites have come to the same decision. There are just not enough enhancements in the 1D IIN over the Canon EOS-1D Mark II that I used as my primary body for many months to justify the time and cost to create a hands-on "N" review. I will however give you with my thoughts on this is excellent 1-Series body as it has a strong niche in Canon's DSLR lineup and consequently, this site's Canon Digital SLR guide. What I write is based on experience with the very similar 1D II, using the identical new features on other Canon Digital SLRs, and my at-least-average ability to visualize other simple improvements (such as buffer depth). Are you photographing sports or other fast-moving action? There is probably no better camera available for this purpose. With an excellent 45-point, high sensitivity autofocus system paired to a rugged, weather-sealed body capable of firing 8.5 very high quality frames per second into a deep buffer, the 1D IIN is ideally suited to capture every moment of fast action. The biggest improvement over the 1D II is, in my opinion, the 2.5" LCD. I have used the same 2.5" LCD on the Canon EOS 5D and now the Canon EOS 30D. And I like it. It is not perfect - I would like to have better visibility in bright daylight without adjusting the brightness (a menu option), but I consider the LCD a nice improvement. The 1D IIN features a new "Magnified View From Any AF Point" option that sounds very useful for checking sharpness. Instead of zooming in (during review) and scrolling to the AF point used, you can now zoom in at the AF point used. Magnified view is now available during quick review as well. The frame buffer can never be too large. I'll take any improvement offered to me in this area - especially when the frames go by at 8.5 per second. However, going from 20 to 22 frames will probably not make much difference to most photographers. The 1D IIN now allows "split recording". The camera can save the RAW file to one memory card (typically the CompactFlash card as CF generally has higher capacity per $ and overall at this time) and the JPEG to the other (typically the SD card). Retained is the ability to save the same image simultaneously to both cards (great for backup purposes) or to save images to one card until it is full and then continue saving on the other card..
Another recording enhancement on the 1D IIN is the automatic folder creation ability. When image 9999 was reached on the 1D Mark II, user intervention was required to create a new folder on the memory card. No user intervention is required when surpassing folder shot capacities on the 1DIIN. The 1D IIN incorporates Canon's Picture Style controls - just like Canon's other recently-released DSLRs. I personally don't find the Picture Styles very useful, but they don't get in my way. I select Neutral and adjust my settings during post-processing. Everyone is different - and apparently many like this simple-to-use feature (or at least Canon thinks so). Users intending to do no post-processing may want to select the "Standard" style. What I do like is that Canon is standardizing the imaging parameters across its DSLR line. The 1D IIN displays the ISO setting in the viewfinder during ISO adjustment. The photographer can now keep his/her eye in the viewfinder while making this change. The 8.5 fps frame rate is the feature I would like to see added to my Canon EOS-1Ds Mark II more than any other. This rate is still the fastest for a Digital SLR. While the 1D IIN improvements over the 1DII are nice, I don't expect many photographers will justify the cost to upgrade from their 1DII. The 1D IIN retains the 1D Mark II's 1.3x Field of View Crop Factor (FOVCF) 8.2 MP sensor and DIGIC II image processor. The following table illustrates sensor and viewfinder differences across the recent Canon Digital SLR models. As no changes were made in this area, the 1D IIN retains the 1DII's excellent, solid feel and includes the built-in portrait grip. Build quality is rugged and the body is weather-sealed. The shutter remains 200,000 actuation-rated. Though heavy compared to a DSLR without a portrait grip, 1-Series bodies are hard to give up after becoming used to them. Since sports/action photography typically requires fast shutter speeds to stop the action, higher ISO settings are often required. Canon CMOS sensors deliver excellent low-noise performance at higher ISO settings. I get a lot of emails asking for help in deciding between the 1D IIN and the Canon EOS 5D. This is not an easy question to answer. In the 1D II N's favor are the frame rate, AF system, 100% viewfinder and weather-sealing. In the 5D's favor are the full-frame sensor, 12.8 megapixels of resolution and, if you are not using a battery grip, size/weight. The FOVCF is one of the noteable differences - makes sure you understand this when making your decision. What don't I like about the Canon EOS-1D Mark II N? The name? Read the 1D IIN white paper (linked below) for more detailed information including some additional minor improvements. The sample pictures are from the 1D II.